The JVC Sophisti Home Theater System is a brand new network media player from JVC. Also known as the JVC DD-3, the Sophisti may sound like it’s a few characters short of a full word (presumably the brand designers had something against “cated”! ), but don’t let that fool you – it’s a full-on media hub that connects to your PC and HDTV, while providing its own speakers and 220W amplifier. It even comes with its own DVD player. Read on for the full JVC Sophisti Home Theater System review. The JVC Sophisti looks more like a Set Top Box (STB) than a traditional home theater receiver, and so would seem to be targeted at the media receiver segment of the market. It’s a cool looking unit, though, with sleek black design, but its sloping front shows it obviously wants to be on top of your stack of STBs. The Sophisti’s main unit comes with a DVD player, which upscales DVDs to 780p, an AM/FM tuner (unfortunately no DAB), an HDMI interface, and power output of 220 Watts. The DVD player will also play CDs. Sound-wise, it can decode Dolby Digital, DTS and Dolby Pro Logic II soundtracks, all of which are routed through to the Sophisti’s speakers (left, right, center channel and a cube-shaped sub-woofer). JVC has patented Direct Drive technology for driving the speakers, which apparently ensures you get the full surround-sound effect without needing separate rear speakers. Indeed, such is the versatility of the Sophisti that you can play MP3 tunes from your USB-compliant MP3 player, videos from a Personal Media Player, or even display pictures directly from a camera if it has a USB port. 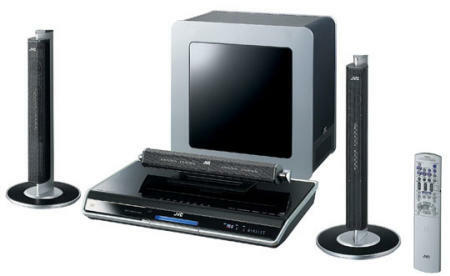 Bets of all, though, the Sophisti will connect with your PC via Ethernet and play any of your media fiiles either through its speakers or onto the connected HDTV. It doesn’t have to be a wired connection, either – you can use the Ethernet port to hook the Sophisti up to a wireless router, and then stream the media (music and video) from any PC connected to your Wi-Fi network. So whether it’s your PC in your study, your laptop, or your kids’ PC in their bedroom, the Sophisti can access all media files and play them for you in your lounge without a PC in sight. The JVC Sophisti DD-3 is currently on sale now, with Pixmania selling it for under £490.